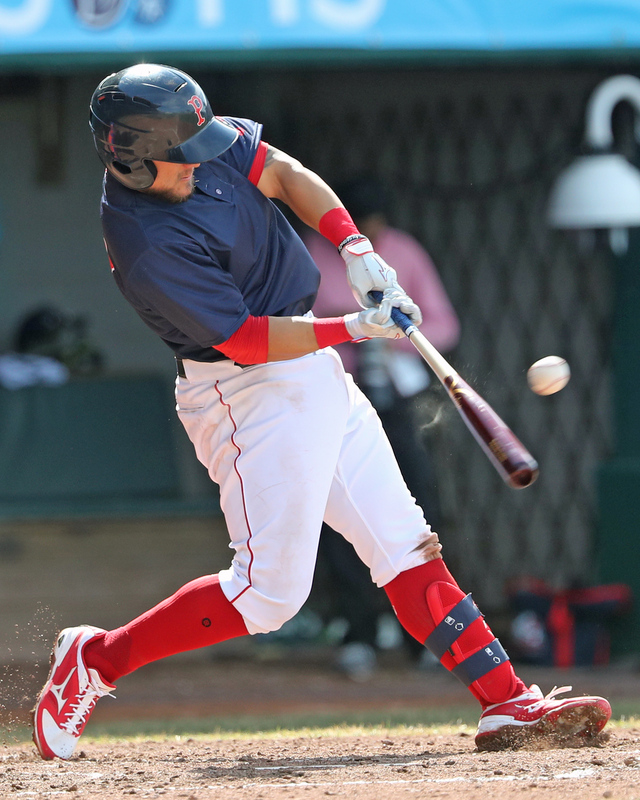 While it was not enough to earn him Player of the (extended) Week this week, SoxProspects.com top prospect Michael Chavis (pictured, right) had a boom or bust start to the season. On opening day, he went 3-for-4 with a home run and walk. He then went hitless in his next 19 at-bats, though he did reach on four walks. In the two games over the weekend he caught fire, going 5-for-8 with two home runs, a double, three runs scored, and two RBI. Perhaps most interesting is his defensive versatility writes Christopher Smith for MassLive. Christopher notes that he has started his first ever four games at second base along with three at third base and one at first. There are injuries and illnesses all over the Boston outfield, and, as Bill Koch writes for the Providence Journal, it is testing their outfield depth. The only member of the Pawtucket outfield currently on the 40-man roster is Sam Travis. Now a post-prospect, the 25-year old has really struggled in the upper minors including a .258/.317/.360 line at Pawtucket last year. This season has not been much better for him, going only 6-for-26 to start the year in Pawtucket and going 2-for-7 in a brief two-game stint with the Red Sox. You might think a player whose career triple-slash line is .359/.395/.511 might rank even higher than 13th on the SoxProspects.com rankings, but that is where Jarren Duran currently slots in. He is right on par with the average age of a positional player at High-A (22 years old) and has continued his dominance of the lower minors, starting the year 15-for-40 with two doubles and a triple. However, prospect status is based on more than batting average, and @RedSoxStats highlights his opposite field approach when hitting the ball in the air. Over the fence, power will likely never be part of his game, but he did have 16 doubles and 12 triples last year and is definitely a player to watch this season. A day late, but Marathon Monday was yesterday which carries a mix of emotions from years past. Jen McCaffrey for The Athletic writes about two interesting stories intertwining baseball and the Boston Marathon. Red Sox jerseys with Boston on the front are not the standard, but ever since the Boston Marathon bombing the Red Sox have worn them and McCaffrey tells the story. In every community represented by the Red Sox organization, baseball has effects beyond what happens on the field. McCaffrey also writes about how the Red Sox continue to play a role in the healing for a couple affected by the bombing. Players of the Week - Extended week from April 4th through 14th. Returning to Pawtucket where he finished 2018, Ockimey started the season out very slowly, going 0-for-8 with three strikeouts over his first two games. Then it all started to click and he finished the week on a 7-for-19 with at least one hit and one walk in each game. His tear also came with plenty of power with three long balls and two doubles. The 23-year-old only hit .215/.305/.398 at Pawtucket last season, so hopefully, this first extended week is a sign he is starting to get comfortable at Triple-A. Mata (pictured, left) had an up and down season in 2018 pitching at Salem as a 19-year-old. His solid 3.50 ERA over his first 72 innings masked a 1.61 WHIP with a 7.3 BB/9. A back injury ended his season in July, further complicating his prospect status. 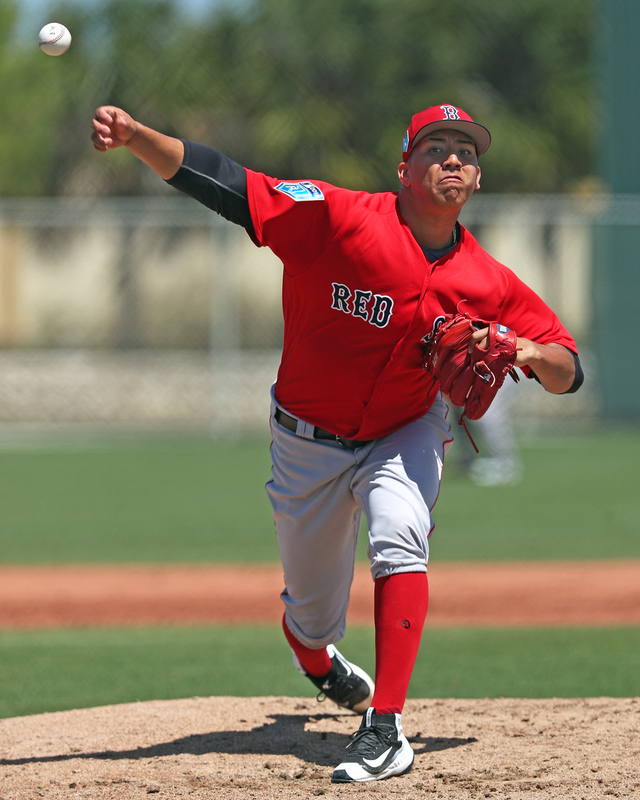 Despite the short season, there was enough potential to land him at 10th on the SoxProspects.com start of the season rankings. Now back to full health and repeating the level, he needs to show improvement to continue to see his stock rise and his first two appearances of the year are a great start. He went 5+ in each start, did not allow more than one earned run in either, and generated a 66.5% ground ball rate, and, perhaps most importantly, only walked one. His second start was even more impressive, fanning eight. The SoxProspects.com scouting report on his player page notes that the "addition of a cutter or slider might also help generate more swings on pitches out of the zone" and early reports have him adding a power slider to start the year. Photo Credit: Michael Chavis and Bryan Mata by Kelly O'Connor. Will Woodward is a Co-Owner and Senior Staff Writer for SoxProspects.com. Follow him on Twitter @SPWill.